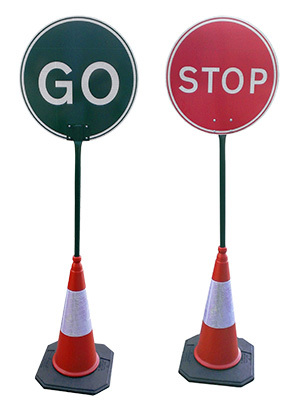 The Alpha Stop & Go sign for manually controlling traffic, comprising of a 600mm head mounted onto a green powder coated steel pole with a weight of 3 kg. The height of the sign is 2020mm. The Alpha Stop and Go sign fits securely into a standard cone. The head is detachable. A 32mm powder coating makes it 100% rustproof. The sign faces are printed on Mlite class 1 or class 2 Reflective Material to meet EN 12899:2007. Donwload the Alpha Stop & Go sign PDF. For further information on Viz Road Traffic Cones, please contact us.